Last fall during a conversation with a friend I complained that frequently I just could not tick off all the items on my to-do-lists and thus had this constant feeling of lagging behind. She coolly said: “Ever thought about that you might have too many items on your list?” That one hit home! At least in theory. I’ve been out of bed after my cold for a week now, but most of the time it still felt like I could only go at less than half pace. That’s not helpful when you have too many items on a list... So I have been taking it as slowly as possible. There is an opening coming up day after tomorrow – but even without this bout of cold that struck me down I had already decided that I am only hanging finished pieces. Never had the urge to make a single new one for this one! It’s in a small gallery in Bad Griesbach, an hour’s drive to the east. I’m looking forward to it, but I have to admit that I have only vaguely thought about which quilts I am actually going to hang. Which will happen tomorrow, I am leaving right after breakfast. The minor problem with the gallery is that part of it is in an old part of the building, which has arches of a vault that limit the possibilities of hanging. 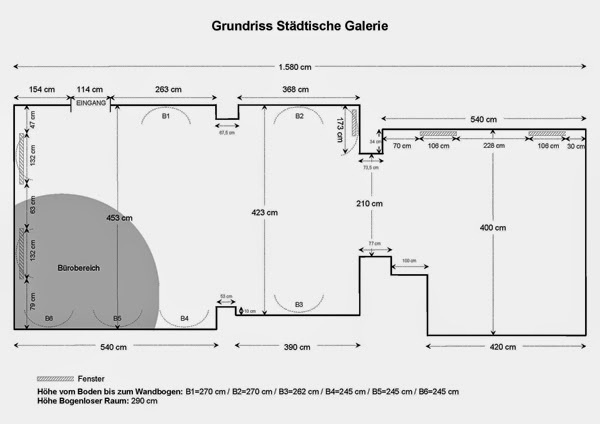 I did receive a floor plan of the whole gallery, but this does not include an indication of how wide the arches actually are. 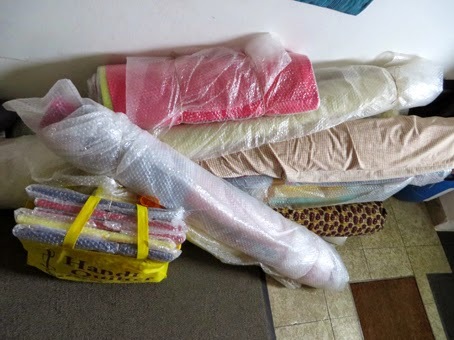 So I figured I will just pack a whole lot of quilts and put up what fits into those arches. I have assembled a whole stack of quilts from my stock. They will go into the car tomorrow morning. And then I will hand whatever is possible, and print out signs and a price list when I return from hanging. And for Friday morning, the day after, I have just secured myself an appointment for an hour-long massage. Now how is that for going at half speed. The perfect way to slow down. It is good to slow down a bit. And that massage sounds great. Good luck with the opening. Glad to her that you are trying to slow down as well. Sometimes we need to stop and smell the roses.